My life is a constant go go GO! It seems like I can never have a minute to myself. With 3 children living at home and one away at college, it can get super busy in my household. I have the high schooler Mr Know-It-All, the junior high schooler Mr. I-Don't-Care, and the pre-schooler Ms I-Can-Do-It-Myself. What that usually amounts to is mayhem. Mr Know-It-All eventually comes to realize that he doesn't really know it all, Mr I-Don't-Care when everything is taken away because he didn't listen, now also realizes that he does care and Ms. I-Can-Do-It-Myself will never admit that she really can't do it all herself, even when asking for help. Between the kids, housework, this blog and everyday life, it seems like I never have enough hours in the day to just do it all. Don't get me wrong, I love my family and I would do anything for them, but there are days when I feel like just taking off and leaving it all behind, even for a few hours. If you're a parent, you may be able to relate to my dilemma. However, it isn't possible, but I have something that is just so therapeutic, it feels as though you've taken some time off. 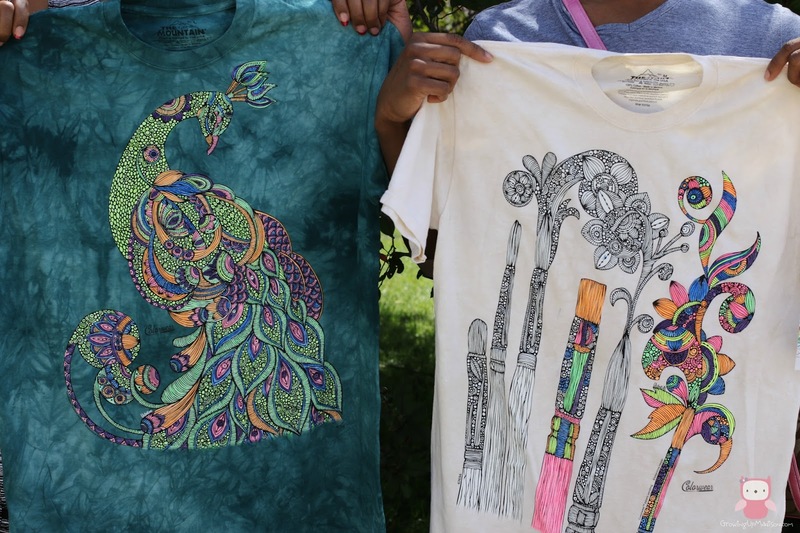 Introducing Colorwear, a new product line released by The Mountain® that aims to create wearable art through completely personalized and colorable t-shirts. We all know that adult coloring books have been the rage this past year and I even have a couple that I've used to release stress. I was told by my therapist that doing things with your hands actually helps with depression so I picked up a couple of them. However, at the end of the day, unless I frame my photo, it's just on paper and that means that my pre-schooler can destroy it. What I love about Colorwear is that I now have something that I can color and wear and that is truly unique since no two will ever be the same. I'm also able to let my creative juices flow and just stay engrossed in what I'm doing, trying to pick the perfect color, etc., that by the time you're done, you're amazed! I recently invited a few of my friends over to a Colorwear party and what a blast we had (faces not shown to protect identity). We had so much fun that we almost forgot that I needed to take photos. One friend in particular actually finished her design because she was so caught up in her coloring and claimed how "therapeutic" it really was. There is nothing quite like having a few friends over and sharing how your week went, talk about the kids and even enjoying time together. Friendship means a LOT to me and I have a few friends who not only take the time to be there for me but they also make my life complete. What would you do without your friends? The t-shirts were all well made and at first we were worried that the markers wouldn't have done a good job, but oh were we surprised, they did amazing! You definitely won't be disappointed with a Colorwear purchase, I assure you! Now Colorwear features 175 captivating designs by popular adult coloring book artists such as Valentina Harper and Angelea Van Dam, and you may even recognize a few of them if you're into the adult coloring book trend. These designs are made to inspire you and give you a therapeutic escape from the stresses of your life. Think about all the housework you have to do! 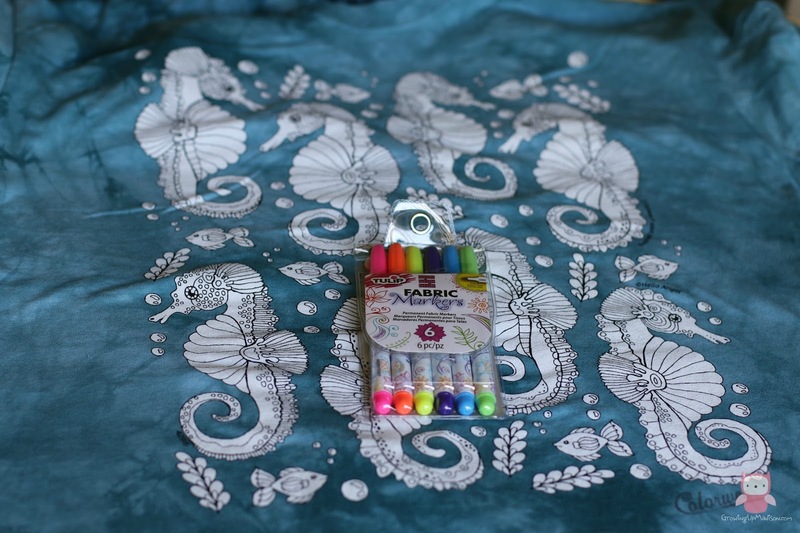 The designs include Mandalas – recognized as sacred symbols around the world, animals and pets, aquatic scenes, gardens, holiday themes, inspirational quotes, and fantasy scenes to let your imagination and creativity run wild. The first photo that you saw of those seahorses are mine and I can't wait to finish it and show it off. Here's something to also note about Colorwear. Their products are environmentally friendly, so you can feel comfortable in the knowledge knowing that you're not harming the world while enjoying yourself. If you're interested in getting your own Colorwear design sign up for their newsletter and get 25% off your order. Here's also something for my readers. You can enter below for your chance to win one of 20 Colorwear Prize Packs. That is really neat! I knew they had coloring books, but not shirts. I need to get some of these for my girls. They'd love it! I think it would make a great party too! Oh yes they're awesome! You should give them a try and remember to get that 25% discount. How awesome is this! I find it really relaxing and it would be nice to do it with the kids or with friends. Aside from wearing your creation, it would also be perfect as a gift! I'd love to give this a try, it's the first time I've heard of Colorwear! I also find coloring very soothing and relaxing and you're right, this would make a great gift. Remember no two would ever be alike. Cool! I recently tried my hand at adult coloring books and it was an awesome experience. Truly relaxing! This is even better - hours of enjoyment coloring and then having the chance to wear it. I would be extremely proud once I've completed a project like that! Oh we all were. I had one friend who did hers that very day. Everyone else finished theirs the next day, but we were all proud of our designs. This is a fun activity! My kids love coloring! Thanks for sharing the discount ! I'd love to be part of an activity like that! Coloring shirts has always been a hobby of mine before. Those are some nice designs up there! They do have some really nice designs and we loved doing them together. This is my frst time to see these! I would love to have that color wear! And you should. Use that discount and order you a few tees. I got my mom really into adult coloring books after she saw me doing it. Funny thing is she does it all the time and I barely do, even though I love it. These tees look like so much fun. I would love to wear something I created myself. That's the best thing, knowing that you created it yourself. They're beautiful and the quality is pretty good too. My goodness, I am just loving it the way how you could color your shirts so easily. 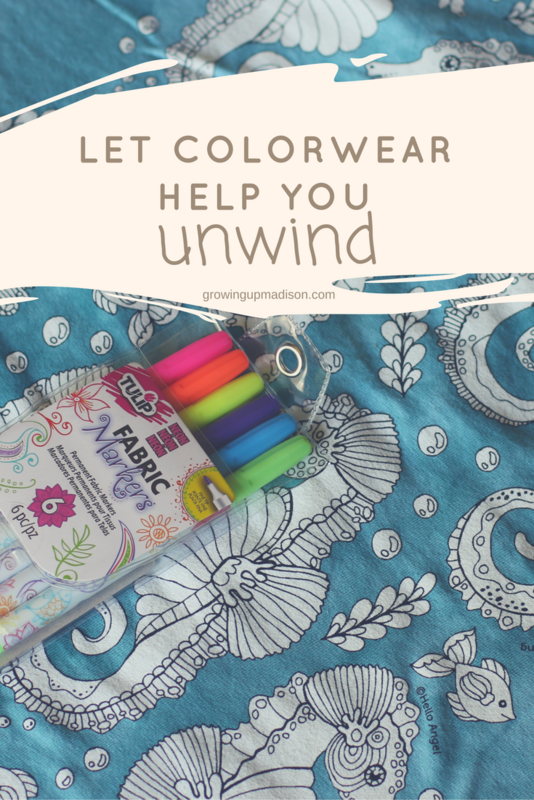 Colorwear sounds amazing and it is great they have 175 captivating designs to make the best out of it. I am going to get this one for my kids! You should also get for yourself too, no need for your kiddo to have all the fun now. Is this not the best way to relive some mommy stress? I'm digging these! These colors are amazing! 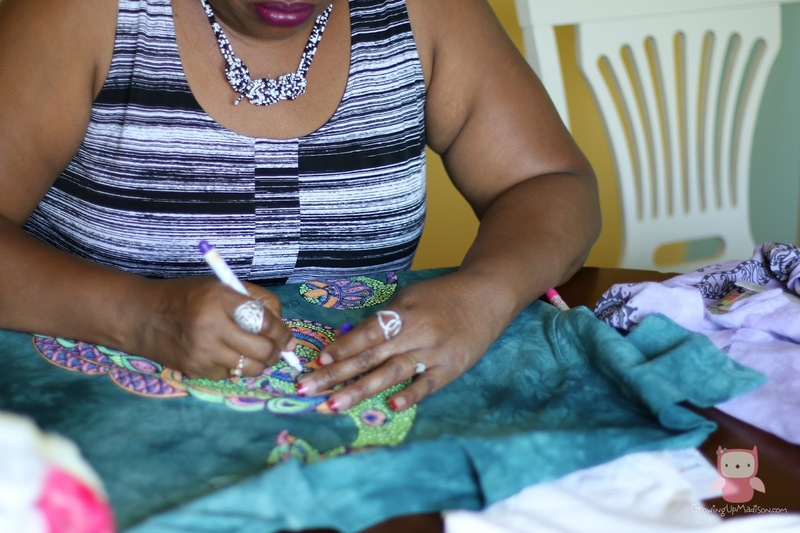 I know my middle daughter would love creating designs and making her own fashions with Colorwear! Making the designs truly yours by coloring them is something that she would love. This would be perfect for those who needs to unwind. I'm sure that I would love to try it and I can also wear my art. That's the best thing about this. You're wearing your art! What a fun and cool idea, I will make it as my habit. I'll have to try and check it out these. You should. If you're into adult coloring books, then you will definitely love these! Thank you and yes it was truly fun to do. That is so cool! This is the first time I've ever seen clothes that I could color. Love it! I so love the idea of coloring my own shirts too and making it uniquely mine. This is so cool and amazing. I love adult coloring book. However, coloring T-shirts would be wonderful. Wouldn't this also make an awesome gift. It would make an amazing gift. I recently got into coloring for my depression so this was great! I love coloring. It really does relax me. I learned about this adult coloring a few years back when I had severe anxiety. It does help calm my mind. Believe it or not, adult coloring truly does relax you. I had no idea until I started it myself. ah, bummer I missed the giveaway! I blame Alaska for that one. This looks severely fun - for the kids and for me. Sign me up! Yes you did but you can always buy a few tees and do them with the kids. They'll love it.